The 5351E thermal detector forms part of the Series 300 range of conventional detectors. This range of detectors has been produced using the latest in manufacturing and design techniques, pushing out the boundaries of existing conventional detector technology. With it’s multitude of innovative features, the Series 300 is a detector which ‘acts conventionally, thinks intelligently’. The 5351E thermal detector incorporates an Application Specific Integrated Circuit (ASIC). Combined with the latest in thermal element technology the detector provides efficient and accurate detection of fires, especially in environments such as bars or kitchens where smoke detectors are inappropriate due to the high level of airborne contamination. 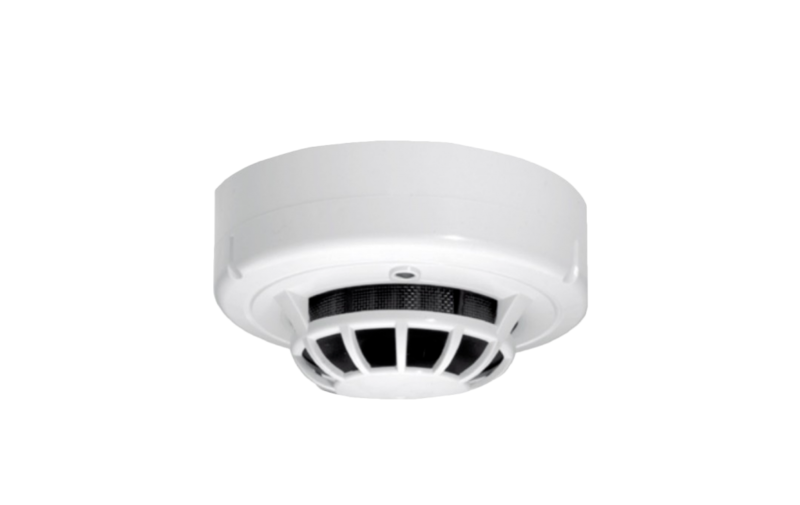 The 5351E and other detectors in the Series 300 range are backward compatible with the Series 100 detector bases, thus providing the capability to upgrade, extend and maintain existing Series 100 installations. The 5351E detector incorporates a bi-colour LED indicator. The integral LED changes colour according to the detector’s status – Green = Normal, Red = Alarm. This benefits the user by providing clear, instant visual indication of the detector’s condition. The Green LED can be programmed for blink/no blink operation. The remote hand-held programming unit can also be used in conjunction with the Series 300 range of detectors to gain access to other advanced features. The features available include: read/write last maintenance date, read value of thermal element and perform an alarm test. Each unit can be given a unique address that will be displayed on the S300ZDU whenever the detector is in alarm. All the features via the hand-held programming unit are achieved effectively and effortlessly without the need to remove the detector or having to gain direct physical access (other than by the use of ‘No Climb Products’ or similar servicing tool), saving valuable commissioning/maintenance time. They provide the end user with the confidence to know that his system is being regularly serviced and that it is operating at its optimum level, with minimum disruption to his own business activities.